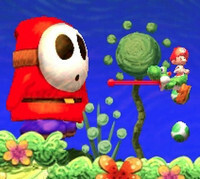 The 3DS follow-up to Yoshi's Island returns in a new trailer thanks to this week's E3 event, and now the next adventure of Yoshi and Baby Mario is known, unsurprisingly, as Yoshi's New Island. See the familiar looking gameplay in action below. Yoshi's New Island is currently scheduled to hit Nintendo 3DS sometime next year.